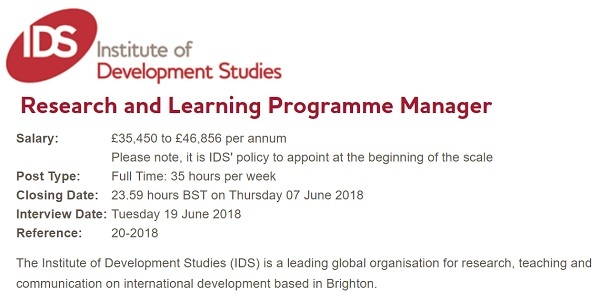 The Institute of Development Studies (IDS) - a leading global organisation for research, teaching and communication on international development based in Brighton - is going to recruit a highly-motivated Research and Learning Programme Manager to join its Knowledge, Impact and Policy team (KIP). The main focus of the role (80%) will be management of the Evidence and Knowledge for Development (K4D) programme, - a five year research and organisational learning programme funded by the UK Department for International Development (DFID), currently in its second year. The successful candidate will be responsible for the management arrangements for the evolving programme of research, learning and policy engagement work being carried out by an experienced team based at IDS and six partner organisations. This role also currently includes management, development and fundraising for other resource centre projects, including the research helpdesk (20%). This position is exciting and unusual, providing a bridge between academic expertise and those working in donor agencies and government policy and research departments. This is a large and demanding programme, with nearly 20 research and knowledge staff members sitting across multiple locations, collaborating closely as a team. The post requires strong management skills, including managing donor and consortium relationships, fundraising, supporting the strategic development of the programme and helping to strengthen the impact of the programme. It involves liaison with senior development agency staff so an assertive and diplomatic approach to relationships management is essential along with excellent interpersonal skills.